Understanding friction in rolling bearings helps save energy and optimize bearing performance. To that end, SKF has released a more advanced friction model that will help engineers select the most appropriate bearing for a particular application. 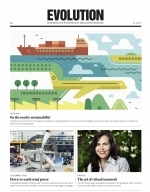 Industry is increasingly sensitive to energy savings and bearing performance. The ability to understand and to model the different sources of friction is essential in the optimization process and also in bearing selection for a given application. 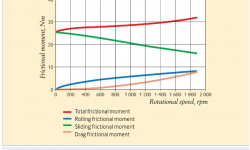 SKF has decided to release a more advanced friction calculation model for rolling bearings. 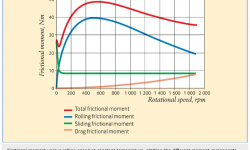 One of the main features of the latest friction model from SKF is the separation of the true physical friction sources in the rolling bearing: rolling, sliding, seals and drag losses. This feature enables engineers not only to calculate friction but also to better understand the bearing function in a particular application. The main function of rolling bearings is to transmit movement with low friction. 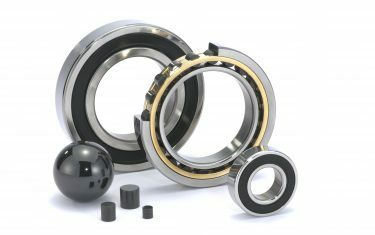 In order to do this, rolling bearings rely mainly on the rolling mechanism itself, which is more energy-efficient than sliding but which also generates friction. Rolling implies low interaction areas (“contacts”) and high concentrations of loads. Due to this and to the elastic deformation of the steel, some sliding is unavoidable. Other sources of energy loss appear in rolling bearings because they are lubricated with either grease, which generally requires contact (sliding) seals, or oil, which in many cases requires a lubricating bath. Apart from the economic impact, energy losses also have an important effect in the bearing operation and life, since they increase the operating temperature and reduce the viscosity. 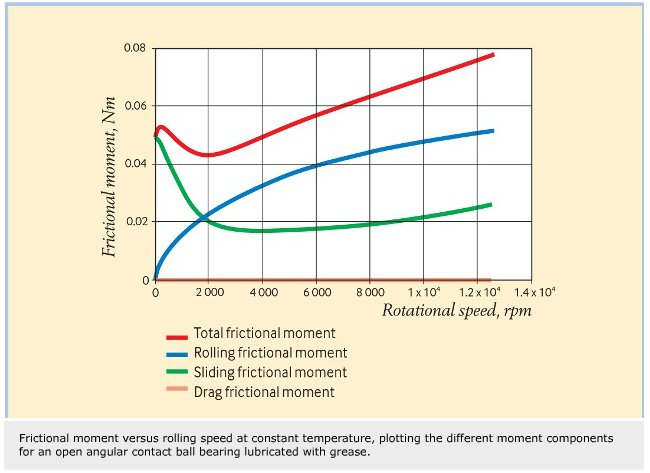 Rolling friction losses are always present in rolling contacts (either dry or lubricated). There are several sources of friction. Energy is spent to introduce the lubricant into the contact and to reject the excess (elastohydrodynamic lubrication process). Elastic hysteresis losses in the steel (energy dissipation in the deformation process) and even adhesion forces between surfaces are mechanisms that can generate rolling friction; besides the fact that purely rolling contacts are only a mathematical idealization, since, in reality, all rolling contacts have micro-sliding because of the deformation of the surfaces. Micro-sliding, however, is considered as a sliding source of friction. 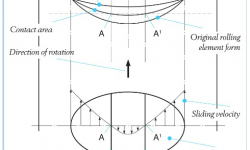 In order to account for the total rolling frictional moment in the bearing, Mrr, first the load distribution in the different rolling element contacts must be established. This depends on the bearing external loads, radial Fr and axial Fa and on the bearing geometry (bearing type and size, number and size of rolling elements). Having the contribution of each contact, they are added together. In the SKF friction model, the influence of the bearing load in the rolling resistance is accounted for in the variables Grr, the geometry of the bearing is summarized by the factors R1, R2 and R3. Inlet shear heating occurs because not all the lubricant present at the inlet of the contact manages to get inside; some of it will recirculate in the inlet because of the reverse flow. This recirculation produces heat, since the viscosity of the lubricant is highly reduced by the temperature; lower viscosity at the inlet of the contact means lower film thickness and, therefore, lower rolling resistance. This effect is taken into account in the SKF friction model by means of the multiplication factor . 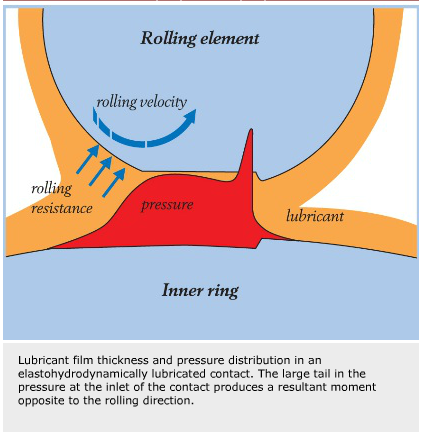 Kinematic replenishment/starvation occurs when high speeds or high lubricant viscosities hamper the replenishment of lubricant in the raceway after a rolling element has passed, since the lubricant will not have sufficient time to flow back from the sides to the center of the raceway. This is kinematic starvation, which will produce a reduction of the lubricant availability in the inlet of the contact and reduce the film thickness and the rolling resistance. The replenishment/starvation effect is considered in the SKF friction model by means of the multiplication factor . This factor is a function of the lubricant supply mechanism as well. The inlet shear heating and kinematic replenishment/starvation factors may interact, but the model has been calibrated to take this interaction into account. Sliding friction in rolling contacts is always present. 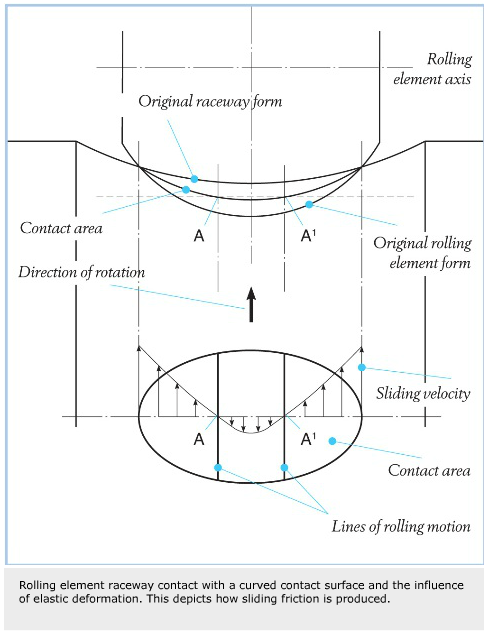 There are two important sources of sliding in a rolling contact: macrosliding caused by contact conformity due to macro-geometry features, e.g., the contact between balls and curved raceways in ball bearings (osculation) and spinning, which is sliding with angular velocity, and micro-sliding caused by the geometrical distortion from elastic deformation. The slip profile in the contact area will produce friction losses by means of lubricant shearing or/and asperity contact, depending on the film thickness/roughness ratio. where, Q is the normal load in the contact, is the shear stress in the lubricant and A is the contact area. 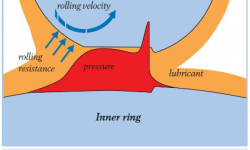 The shear stress in the contact will depend on the slip profile (sliding speed) and the lubricant rheology. where is the friction coefficient between the interacting asperities, it is influenced by the lubricant additive package. The function is a weighting factor for the influence of asperity and lubricant shearing mechanisms. Modeling and experimentation have been used by SKF to obtain the equation and diagram provided in the SKF General Catalogue 6000. In order to account for the total sliding frictional moment in the bearing, named Msl, the contribution of each contact is added together. In the SKF friction model, the influence of the bearing load in the sliding resistance is accounted for in the variables Gsl, and the geometry of the bearing is summarized by the factors S1, S2 and S3. Seal friction is caused by the sliding between the lip of the seal and the moving steel counterface. For contact seals, e.g., indicated by designation suffixes RSH, RS1, LS, CS, CS2 and CS5 in SKF product catalogs, the contribution of the seal to the frictional moment represents a large percentage of the total bearing friction. 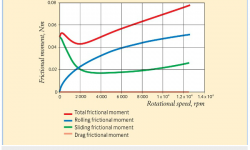 The SKF model provides a method to calculate the seal contribution to friction. 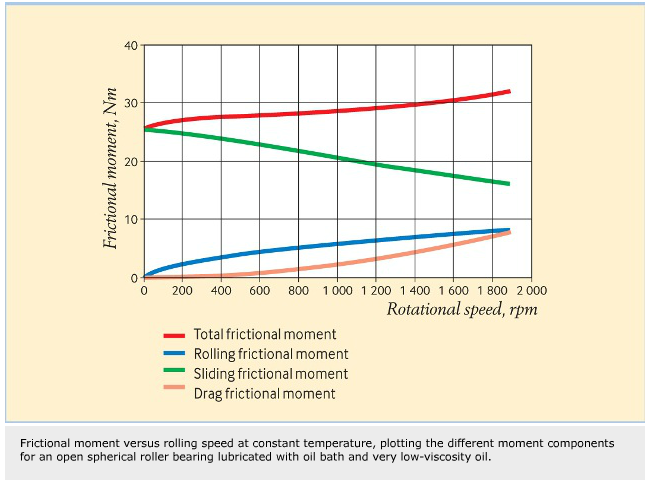 The SKF friction model can include the energy losses due to oil drag in a lubricant bath. 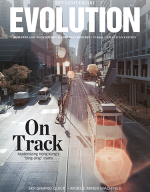 The present model has some restrictions, especially in large-size bearings, high speeds and high oil levels; in-depth studies are ongoing to overcome these. The electronic version restricts the calculations when the limitations of the model are exceeded. 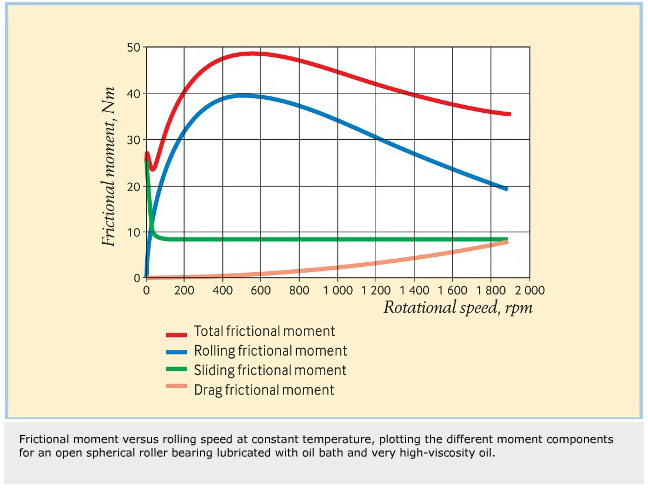 Due to the separation of the physical sources of friction, the SKF friction model can be used as an engineering tool, since more information than only friction values is obtained from the model. Two examples will be given where the model is used to explain the functioning of the bearing. The model can reproduce typical Stribeck curves as seen in friction measurements, with relatively high friction in the low-speed (or lowviscosity) region, followed by an area of lower friction because of the film build-up for higher speeds. As the oil film increases with even higher speeds, rolling friction becomes dominant and will increase the frictional moment, until kinematic starvation and inlet shear heating reduce the film thickness. The starting torque of the bearing can be calculated by setting the speed equal to zero. Then friction will only come from sliding and seals. 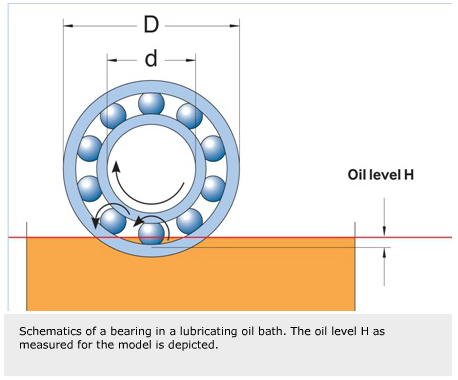 Using the results from equation (3), it is possible to plot separately the different friction sources for an open (unsealed) spherical roller bearing lubricated in an oil bath with very high viscosity. For very low speeds, there is a small area of high sliding losses, due to the asperity interaction; very quickly the sliding losses decrease (due to the film build-up) to a steady value. However, rolling losses grow from zero (at zero speed) and become dominant very quickly, with a maximum value at about 500 rpm. As velocity continues increasing, rolling friction decreases because of kinematic starvation and/or inlet shear heating; this is no doubt a sign of excessively high viscosity in the application. The factors and are now taking their toll. By looking at this behavior, engineers might recommend lower viscosity oil for this application. 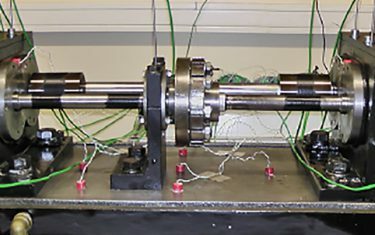 The opposite behaviour can also be demonstrated, where the same bearing and operating conditions have been taken but now the model has been run using very low viscosity in the lubricant. For this case, sliding losses are dominant in almost all the velocity spectrum. Certainly when increasing speed sliding losses decrease, but not quickly enough. Contrary, rolling losses are very small in comparison with sliding. This is because the film thickness is so thin that the asperity interaction in sliding becomes dominant. The bearing could fail because of insufficient lubricant film. Engineers might recommend higher viscosity oil for this application. 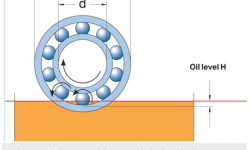 The effect of centrifugal forces and spinning in an angular contact ball bearing can also be estimated, using the example of an open angular contact ball bearing lubricated with grease. 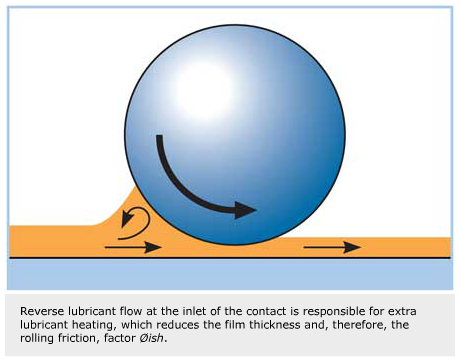 The sliding losses are high at low speed (asperity interaction), but as velocity increases and the lubricating oil builds up film, they are reduced. However, when speed increases to high values, sliding losses increase again. 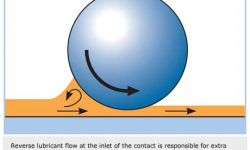 This latter increase is caused by the increase of centrifugal forces from the balls (increase of load and spinning in the ball-outer ring contacts). The SKF friction model considers the centrifugal forces for some bearing types in the variables Grr and Gsl with the symbol Fg. 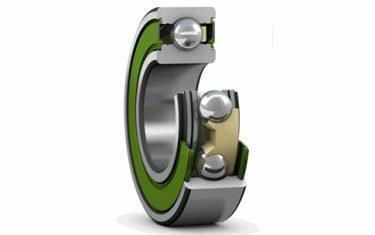 As the SKF model is able to separate the different factors that contribute to friction and provide more information about the way the bearing functions, it is a valuable engineering tool when selecting bearings and designing systems incorporating bearings.